You Are Here: Home » Increasing Income » Make Money by Giving Away Clothes for Free? Make Money by Giving Away Clothes for Free? 58260 Comments - Leave a comment! I am not kidding, the title doesn’t lie. That is absolutely what happened to me a few weeks back. 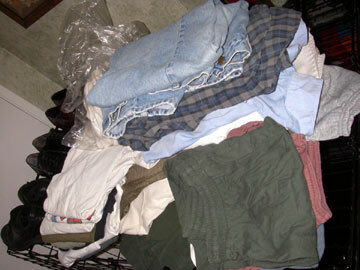 I have been trying to get rid of superfluous items in my life and that includes clothing. I don’t know if i could ever give up as much as Colin has over at Exile Lifestyle and have such a small wardrobe, but i think a good purge every once in a while is a satisfying experience. Most recently, i was cleaning out my closet and stuffing items into a garbage bag for when i would eventually bring them to Goodwill. I am not sure why, but for some reason i felt the urge to check the pockets in one of my old pairs of jeans. What did i find, 2 slightly laundered Andrew Jackson’s! I was giving away clothes for free, and all of a sudden i was $40 bucks richer. There was no better story i told to friends for the next few weeks. It may seem like a waste of time, but think about it; if you are giving these clothes away, odds are you haven’t worn them in ages. Do you really remember if those pockets are empty from the night you went out clubbing 8 months ago? Be smart, check your pockets, then donate those items. 58,260 Responses to Make Money by Giving Away Clothes for Free?